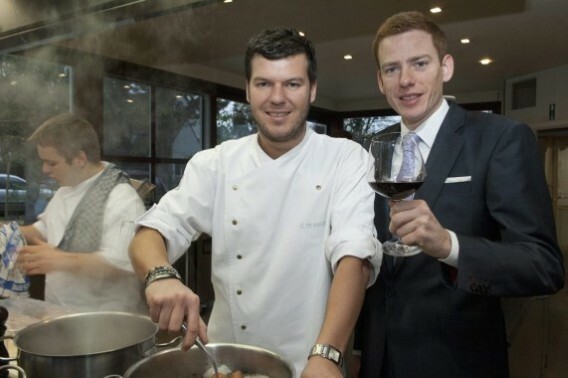 Gert De Mangeleer and Joachim Boudens Chefs at restaurant Hertog Jan in Brugge are the new “Cullinary personalities of Belgian Gastronomy” 2012. This was announced sunday 18/11 at Horeca Expo in Ghent. An expert jury nominated eight candidates. The title goes to a belgian gastronomer who accomplished pioneering work in the past year or contributed in a meritorious way to the culinary industry. “Gert and Joachim succeeded with Hertog Jan to gather (starting from none) 3 stars in a time span of just seven years. Gert belongs to the 3 youngest 3-star chefs in the world, ” according to organizer Horeca Expo. “Joachim, partner and supervisor, achieved in 2004 the degree of First Sommelier of Belgium and was nominated in 2011 way ahead of the other candidates ”Sommelier of the Year”. The two friends are working on a new project on their farm with an own vision on ecology and their own vegetables.